Police stand next to a cordon after five people were shot and injured on an open street in central Malmo. SWEDISH POLICE SAID several people have been injured after shots were fired in Sweden’s third-largest city. 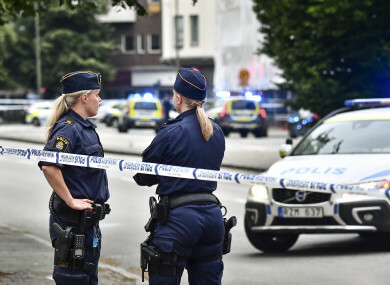 Swedish news agency TT said the incident happened in Malmo just after 8pm and quoted the city’s police department saying “there is no reason for the public to worry”. Tabloid Aftonbladet quoted witnesses saying they heard what sounded like 15 to 20 shots. Witness Jonatan Burhoff told the newspaper he saw wounded people being carried to private cars that drove off “as fast as possible”. Police said security at a hospital was stepped up after the gunfire was reported. The statement said officers had information that “one person had been taken to hospital in a private car”. Suburban feuds between criminal gangs fighting over territory have taken place in major Swedish cities in recent years. Aftonbladet said the shootings took place next to a police station so officers were on the scene immediately. There were no immediate details on the conditions of the injured men. Email “Shooting in Sweden leaves 5 men injured”. Feedback on “Shooting in Sweden leaves 5 men injured”.